“One, two, three…say cheese!” a voice yells as the camera clicks. A group clad in blue T-shirts poses in front of a bright blue the Star 99.1 radio van, holding up vibrant, multicolored backpacks proudly for the camera. Tired but happy, thirty participants from countries around the world gathered in Lewis Morris Park. 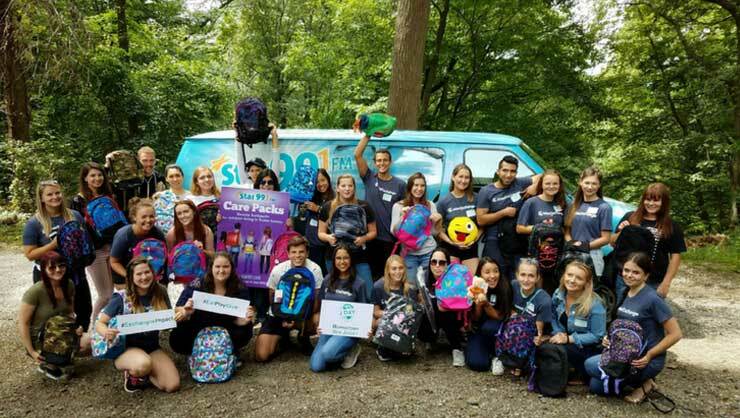 They have assembled backpacks containing everything from toiletries to stuffed animals, destined for children in need. With the help of local station Star 99.1, the group donated and distributed the supplies to a local nonprofit, Foster and Adoptive Family Services, as part of a larger care pack drive. InterExchange participants in Morristown, NJ hold up care packs for donation. 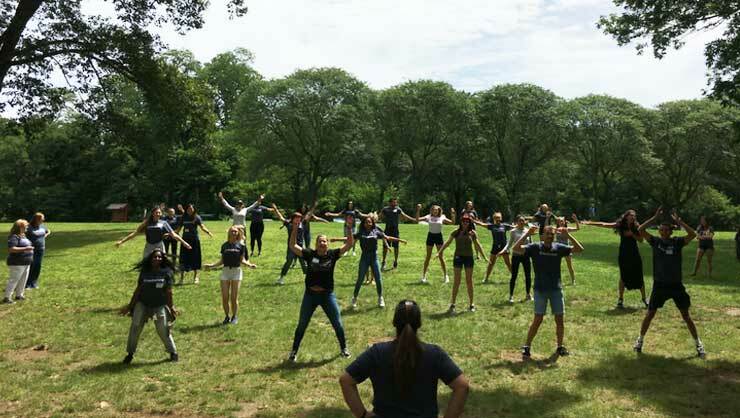 This gathering in Morristown, New Jersey – one of seven InterExchange-organized J Day events across the United States - mobilized students on J-1 visas in the United States to “Eat, Play, Give.” Emphasizing the importance of cultural exchange, J Day was first organized in 2014 by visa sponsors in coordination with the Alliance for International Exchange. 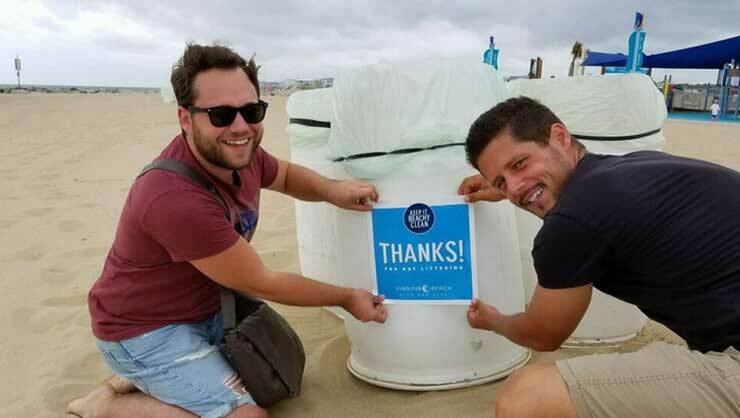 InterExchange celebrates J Day annually through food drives, swimming contests, beach cleanups, and more in order to provide visiting J-1 participants across the country the chance to give back to their host communities. 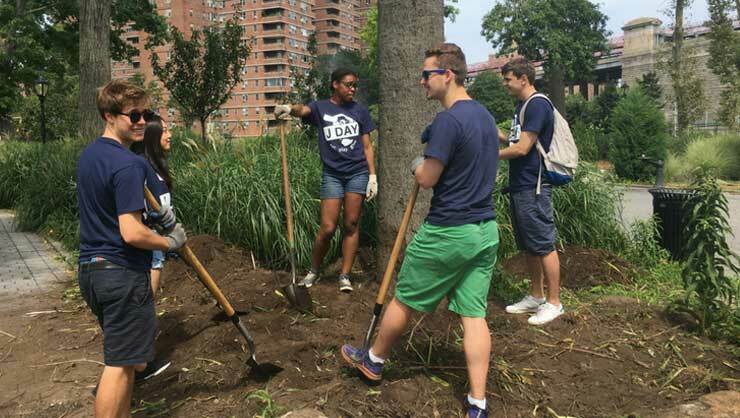 J Day participants helped make Manhattan a little greener! Alexandra Osep, an au pair in New Jersey, originally heard about the Morristown event at a cluster meeting from her local coordinator (LC), Dawn Middleton. Middleton prepared the au pairs with a list of items they could donate to kids in the foster care system. Naturally, Osep headed to Target to buy a few supplies to add to the care packs for the kids. “They were just small things, like a toothbrush and paste, some shower gel, and some paper and pencils, but I am sure the things will find their way to kids that need it,” she said. New Jersey au pairs play "Simon Says" during J Day. Becky Davis, a Work and Travel USA local coordinator in the Wisconsin Dells, has organized InterExchange’s J Day events in the region for many years. Her local event focused on providing school supplies for underfunded classrooms, with an emphasis on aiding teachers and low income students. J Day not only allows participants to gather together and celebrate their communities, but it also serves as a teaching moment. “I think these events help the students really connect with the community,” Davis commented. 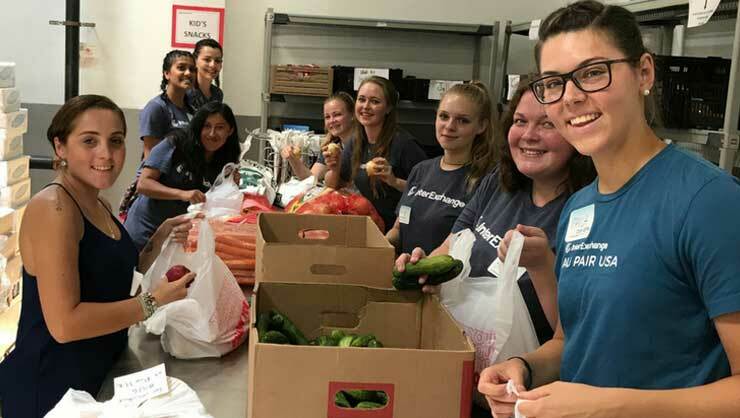 “It helps them realize that not everyone in the U.S. has a lot of money.” Connecting the participants to the needs of the community helps them get beyond stereotypes, and introduces many students to the concept of volunteering for the first time. At the end of the day, Davis was pleased to observe many of the students offering their help with cleanup after the fun and games were done. In Lake Ridge, Virginia, InterExchange Work and Travel USA students celebrated the day at the PremierGuard Olympics. Testing the swimming skills they honed over the summer, the students and their fellow employees competed for raffle prizes at an event in partnership with their host organization. Michael Turek, the International Program Director at Premier Aquatics, has been hosting the PremierGuard Olympics for ten years, and began synchronizing it with InterExchange J Day celebrations in 2013. Turek organizes many events for his J-1 students throughout the summer. “We bring our staff to a Nationals baseball game, organize Ocean City and Kings Dominion Day trips, weekly soccer games, and an end-of-the-season appreciation party,” he told us. “I believe that J Day is the most popular event where our lifeguards can compete between areas and cheer for competitors from their own countries.” Alongside the fun and games, Turek firmly believes in the mission of gathering together to give back. “Our employees do not always realize how important and meaningful food donations are,” he reflects, “unless they do it themselves and listen to the food bank representative's speech.” Participants collected over 1,215 pounds of food at the PremierGuard Olympics event. The InterExchange Au Pair USA cluster in Raleigh assembles food donations. InterExchange Work & Travel USA participants keep Virginia Beach "Beachy Clean."